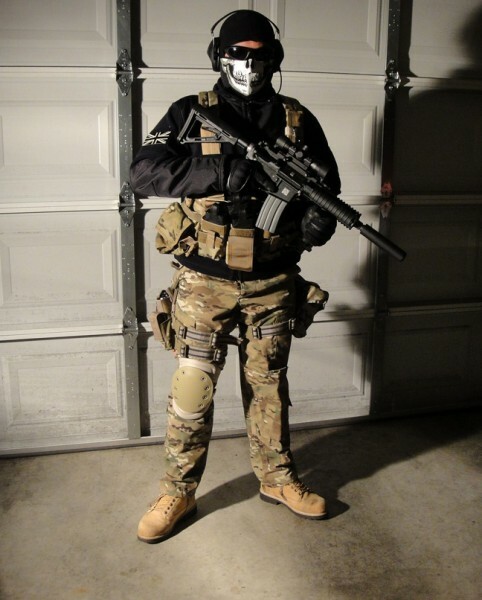 I (Boltrig) use an Echo 1 non-blowback G36c as a primary weapon I keep a red dot scope, a homemade silencer, an NCstar sling, a foregrip, and a flashlight-customized with some ACU duct tape . As a secondary weapon I use a non blowback Crossman Co2 pistol. Both guns are 400+ fps. I carry 5 water balloon grenades and a smoke tube also. Blaze uses a three barrel shotgun that is 360 fps and a single shot shotgun that is 380 fps, both are pump. He also carries several grenades and a smoke tube. Longshot uses an L96 with a bipod, scope, and sling that is 495 fps. He also uses a blowback green-gas KWA pistol that is 330 fps, He carries 3 grenades and a smoke tube also. Vsevlod (Claymore) uses an Echo 1 tactical AK-47 that is 400 fps and a taurus Co2 pistol that is 400+ fps. He keeps several different kinds of grenades too. Tripwire carries an H&K mp5 that is 350+ fps and a Taurus Co2 pistol. He does not carry a grenade. MNM carries an M-4 machine gun and a Thompson that are both 400+ fps. He does not carry any pistols or grenades. Vsevlod and I provide the other members with grenades and smoke bombs. 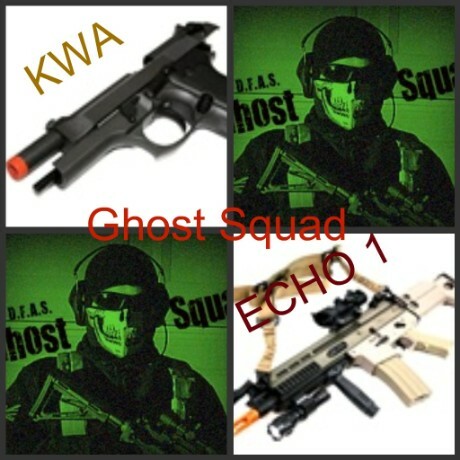 The image to the top right does not belong to me, but it seemed to fit the name Ghost Squad.